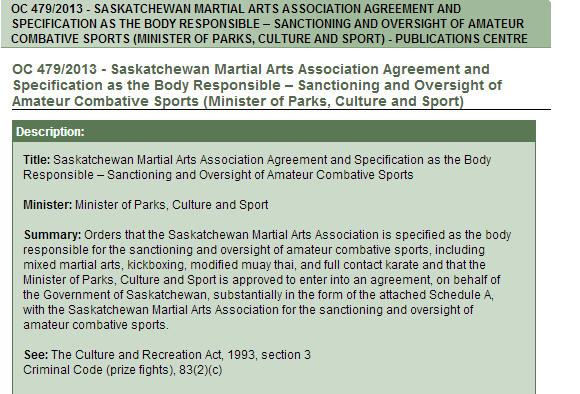 Last September I highlighted an amateur MMA event which took place in Weyburn Saskatchewan without SMAA sanctioning. (The SMAA is the body designated by Order in Council 479/2013 with the power to sanction and oversee amateur combat sports in Saskatchewan in compliance with the Criminal Code). On September 28th 2013, a mixed martial arts event, promoted by Prestige Fight Club, was held in Weyburn. Allegations at the time was that the event was non sanctioned and as a result a police investigation was commenced. This investigation was as a result of changes to the Criminal Code which came into effect in June 2013. The changes to the Criminal code require events such as a Mixed Martial Arts contest to receive sanctioning under the authority of a provincially authorized athletic board or commission. The investigation and prosecutorial review have been completed and as a result charges of ‘Engaging in a Prize Fight’, contrary to Section 83(1) of the Criminal Code have been laid against the owner and a promoter of Prestige Fight Club. A 48 year old male from Beinfait, Saskatchewan, and a 45 year old male from Qu’Appelle, Saskatchewan have been issued a Summons to appear for Court on Tuesday March 11th at 10am in the Weyburn Court House. It is unfortunate it had to come to this, however, these charges serve as a teachable moment that unless events are held in jurisdictions with the proper legal framework required by the Criminal Code, prosecutions for illegal ‘prize fights’ are now a reality in a post Bill S-209 world. Many jurisdictions in Canada lack this framework. The upcoming Amateur Mixed Martial Arts Championship Series #3 in Ontario is another event which may face a similar fate. Anyone considering participating in this event would be wise to contact the Provincial government for assurances that prosecutions will not follow. It is unlikely the Province would provide such an assurance. While there is much work to be done before a proper framework for Amateur MMA exists throughout Canada, the solution is not to host unsanctioned events. Stakeholders are better served lobbying their Provinces to pass appropriate laws. 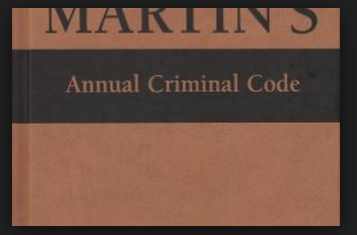 Until that time participating in events in Provinces lacking a legal framework risk colliding with the Criminal Code.